Washington, DC, March 24, 2015	(Newswire.com) - "Women-owned firms are very active and competitive in federal supplier marketplace," says Margot Dorfman, CEO. "The U.S. Women's Chamber of Commerce recognizes firms who stand out for the achievements they have made in this challenging marketplace," adds Dorfman. 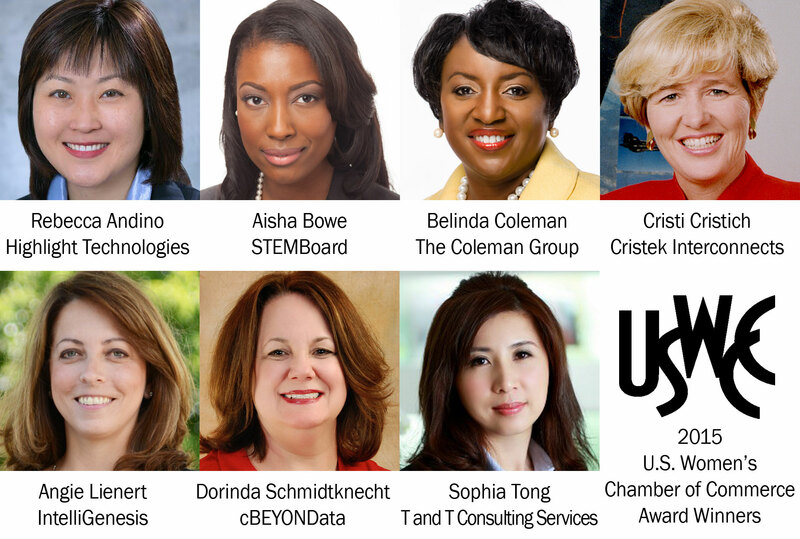 The U.S. Women's Chamber of Commerce recognizes firms with the following awards: Innovation & Performance, Growth Master, Emerging Star and Stellar. STELLAR: Awarded to exceptional federal suppliers who have shown exemplry growth and quality and are positioned as leaders within the contracting community. Angie began her career as an Arabic Linguist in the United States Air Force in 1993. While serving her country, she earned both an AAS degree from the Community College of the Air Force and a BA degree from Regents College. After she served six years in the military and was honorably discharged, she continued her work in the Intelligence Community as a defense contractor during the day, while pursuing higher education in the evenings. Angie founded IntelliGenesis LLC in 2007 and assumed her current role of President and CEO in the fall of 2011. GROWTH MASTER: Awarded to exceptional federal suppliers who have achieved significant growth in the government sector over the last three years. As founder and CEO of T and T Consulting Services, Inc. (T&T), Ms. Tong provides exemplary leadership and drives T&T’s strategic direction. Her contributions have been instrumental in creating exponential growth T&T has experienced over the last 3 years. Under Ms. Tong’s stewardship, T&T has grown from its founding in 2004 to a Capability Maturity Model Integration (CMMI) Maturity Level 2 appraised organization with a broad array of federal government and commercial clients - including the Department of Defense, Department of Health and Human Services, Department of Veterans Affairs, and Department of Homeland Security, among others. Rebecca Andino has supported Federal agencies for over 15 years, as a database developer, project manager, and currently as the founder and CEO of Highlight Technologies, an 8(a) certified, economically disadvantaged woman owned business. She is passionate about integrating and aligning all of the components of the company -- strategic planning, accounting, finance, business development, human resources, security, contracts, program management, and quality -- to deliver high value to Highlight’s customers and employees. The company experienced record growth in 2014, doubling in both revenue and number of employees. INNOVATION & PERFORMANCE: Awarded to exceptional federal suppliers who exhibit outstanding innovation and/or performance on a key contract that will significantly bolster their ability to secure future opportunities. President and CEO Belinda Coleman has twenty-eight years of experience in systems engineering, information technology, and program management. Her vision and eighteen years of leadership experience in informatics and policy development has guided the strategic growth of The Coleman Group into a competitive forward thinking business with a reputation for delivering quality and value. The Coleman Group is provides information technology solutions and services in cyber security, health care informatics, procurement management solutions, software development solutions, and security services. Cristi Cristich founded Cristek Interconnects, Inc. at the age of 23 with a fistful of credit cards, a loan from a friend and a purchase order from a gutsy purchasing agent at Litton Industries. Cristich began her career as a part-time receptionist for a Northern California electronics firm during the summer of high school graduation, intending to work while attending college. Instead of pursuing her education, she chose to support herself by transitioning to a full time position. When a large conglomerate purchased her employer in 1985, Cristich seized the opportunity to begin her own company on little more than the strength of her word. Cristich’s top priority is meeting her commitments to employees, customers, family and the community. A strong conviction that business leaders should contribute to society through both philanthropic efforts and the political process, has led to Cristi’s involvement in many organizations over the years. EMERGING STAR: Awarded to exceptional federal suppliers exhibiting outstanding growth and achievement in developing federal contracting markets and opportunities. STEMBoard is composed of aerospace and defense engineers who are leading innovative and disruptive change within the defense and intelligence community. STEMBoard’s core competency is in creating real-time situational awareness applications that span the Cyber and C4ISR paradigms. A Protégé of Millennium Engineering and Integration Company within the Department of Defense’s Mentor-Protégé Program. Millennium is an employee-owned, veteran-owned systems and spacecraft engineering company with world-class systems integration and software development capability for end-to-end mission assurance. STEMBoard collaborates with Historically Black Colleges and Universities to expose and encourage more students of color to pursue STEM careers and hosts STEM camps at no cost for K-12 students. STEMBoard is committed to closing the achievement gap by empowering historically underrepresented youth build transformational technologies. With more than 20 years’ experience in the Business Intelligence arena focusing on Business Analytics, Big Data, and Visual technologies and implementations, cBEYONData specializes in supporting Government agencies with a need to protect their highly secured information assets. A large percentage of the cBEYONData team has the ability to work on those sensitive projects. cBEYONData's clients range from agencies within the Department of Defense and Federal Civilian organizations to health care, financial services, consumer goods, manufacturing, and energy to commercial, industrial and not-for-profit clients.